Daily Messes: Peeka Boo...I See...Puppets! My kids love making puppets and putting on a puppet show. 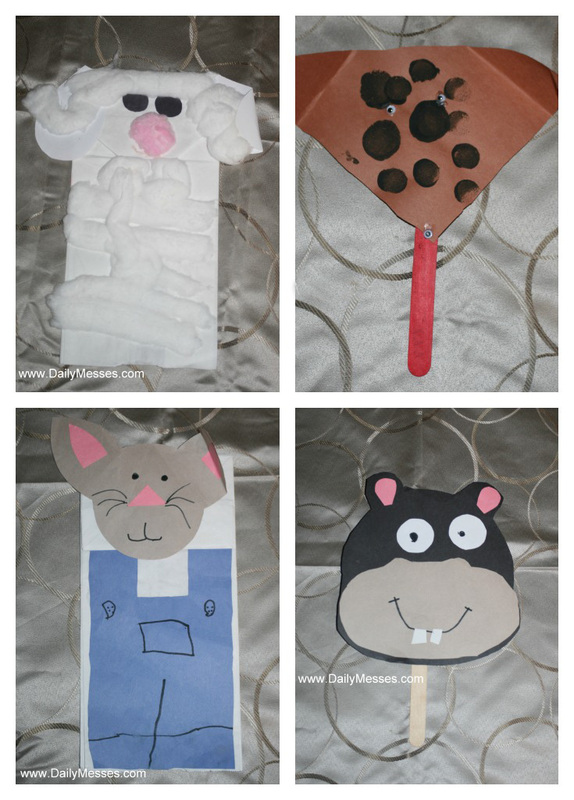 They've made a variety of puppets (sheep, dogs, mice, zoo animals) and have used paper bags, popsicle sticks and even just socks to create the puppets. Puppet shows are also a great way to encourage their imaginations and creativity! I love hearing the stories the kids come up. It also helps keep my kids busy on rainy or snow days. 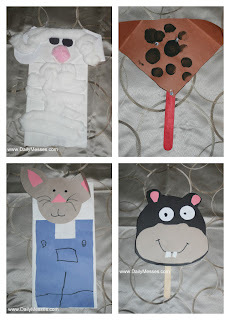 Puppets are super easy to make and they don't have to turn out perfectly! We normally have most of the basic items for a puppet: paper bags, construction paper, popsicle sticks, pens/markers/crayons/paint, and glue. (DM Tip: I like using glue sticks because they make less of a mess and you don't have a line under the paper where the glue dried.) Sometimes I have shapes cut out for them to use and sometimes they cut out their own shapes. We just started venturing into using cardboard tubes to make some of our puppets. It makes a great dragon, alligator, or snake!